More 6GB voice and data plan deals are coming your way, and this time it’s from the sub-brand of Telus, Koodo (which just recently offered iPhone unlocking). 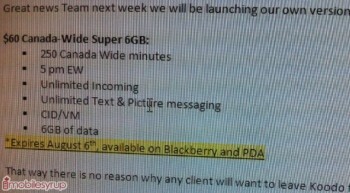 They plan on introducing the ‘Canada-Wide Super 6GB’ plan for $60/month starting next week until August 6th, reports MobileSyrup. If you don’t have 6GB data and want it, now seems to the time to jump on these ‘deals’. Just this week we saw 6GB promos from Rogers and Bell/Virgin. This is a decent deal because it includes caller ID and voicemail and 6GB of data for $60/month. Let us know if you’re going to jump on this in the comments! Don’t you just love competition?